"It's hard to say what's more amazing: my music, or my outfit. No wonder Salieri hates me." He Said: "Du, du, du du" Oh wait, that's Beethoveen's 5th, nevermind. As a disclaimer, the only version of this movie that we could find is the director's cut rather than the theatrical release, so obviously the version that won the Oscar is not the same that we watched, and perhaps it makes it slower and more drawn out or boring when watching the extended versions, but there you have it. Amadeus is based on a play that is loosely based on the life of Wolfgang Amadeus Mozart through the eyes of his fellow composer, Antonio Salieri. The film/play takes a lot of artistic license with regards to the real life of Mozart. Perhaps his life was only slightly interesting and so they pumped it up a bit to make it more entertaining. I am all for films being foremost entertaining, otherwise what's the point, but this one seemed to go too much in that direction and moved to far away from history. The movie, at least the first half, has a lot of comedic points thrown in, even though the subject matter is rather serious, it made me think that this must have been one of the first 'dramedies” and perhaps ahead of its time in this regard. The portrayal of Mozart was one of a young immature twit. Now I don't know anything about him historically but it just seemed to unreal, he had an awful high pitched shrill laugh that he would laugh at the most immature things. He would tell off his seniors including the Emperor of Austria. The Emperor just seems to take it and give Mozart more and more leeway. Now I don't know anything about Emperor Joseph II, but from our knowledge of heads of state from that era, I highly doubt he would put up with as much back-talking from young Mozart as he did in the film. Speaking of the Emperor, who the hell would think that Jeffrey Jones would be in that role? He seems like he is better at his creepy principal, mad-scientist, etc. from his 80s comedy work than this movie. Old man Salieri seems very bitter, wishing he was as talented as Mozart. 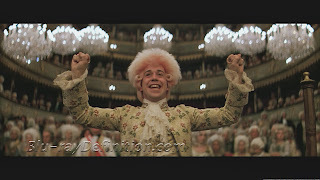 During the movie he seems to move from hating Mozart and being jealous of him, to being envious of his abilities, and then almost pitying his fall to bankruptcy and insanity. According to the brief history that I have read, it sounds like Mozart and Salieri were more kindred spirits and closer than portrayed in the film, but without a battle between these two characters the film would fall rather flat. I found the first half quite interesting, not really from a history standpoint, but just interesting with the characters and the story, the second half felt dull prolonged and boring. Maybe this is in part due to the fact that we got the director's cut, maybe the theatrical release would have been shorter in this area and a bit more tight and less boring, but I will never know as I am not watching this one again. The one thing going for the second half is how we watch the devolution of Mozart into insanity, and frankly the way it was directed along with the musical score, I started to feel like I was going crazy too. 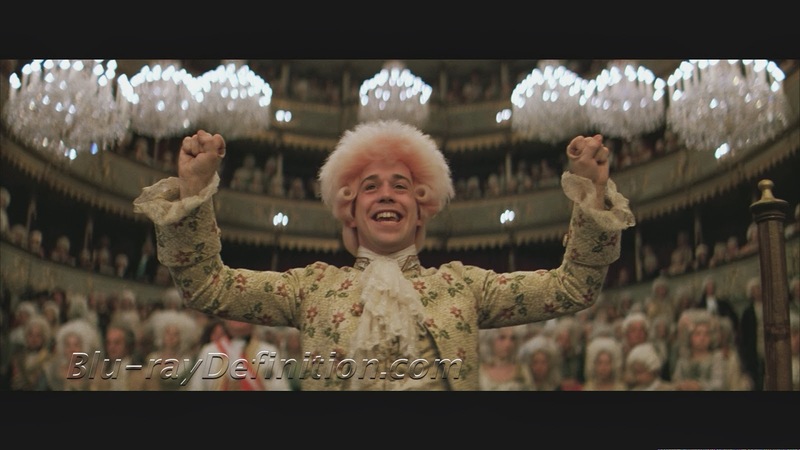 Some of the acting in the movie was really well done, although the one thing that stood out (not in a good way) was Tom Hulce's over the top portrayal of Mozart, I just did not find it interesting or believable, it just felt annoying, and why oh why did they not give him a proper hair cut. Yes he spends most of the time with period wigs on, but there are times that he doesn't have a wig on and his hair is a very 80s mild mullet and it just doesn't fit in the period at all (it reminded me of how Kevin Costner kept his mullet hair for Dances with Wolves). The musical score was nice, and as one would expect, filled with period music mostly of Mozart's operas and symphonies. Overall, an average film that was mildly entertaining, but certainly nothing Oscar worthy. Now as usual, I haven't seen any of the other best picture nominees, so it is hard for me to say this wasn't the best of that year, but with other 1984 films such as Beverly Hills Cop, Splash, and Indians Jones and the Temple of Doom, there are other films that I liked better from that year. If the Academy gave this the best picture then I wouldn't want to watch the other nominees, although the novel A Passage to India is quite good and I really like E.M. Forster, but I don't think that would translate too well to the screen. After reading the "she said" review, I guess I completely missed the god stuff, I mean it was there and I remember it, but I didn't really absorb it and interpret as nicely as she did. huh? Yes I was wondering the same thing, never heard it, from 1938, and it does star one James Stewart. Should be at least interesting to watch and see how the movies were so different back then. She Said: I never knew Mozart was so.... ridiculous. But as for Amadeus, it was good. Crazy good. Now, was I entertained? Somewhat, but not really. Was I moved? Sort of, but again, not really. But does that mean it wasn't any good? Nope. For example, i've never really understood the appeal of the Mona Lisa, but I know it's good. Crazy good. This movie tells the story of a highly fictionalized rivalry between two composers: Mozart and Salieri. 'Highly ficitionalized' in the sense that there WERE two composers named Mozart and Salieri (I'm sure you've heard of at least the first guy... :)), who did indeed know each other in Vienna, but had no historically verifiably rivalry that we know of. That kind of 'highly fictionalized'. The real conflict in the movie, though, is not between Saleiri and Mozart, but between Salieri and God. All Salieri wants in life is to glorify God through his music, but, alas, he is only mediocre at best. Mozart, on the other hand, is... wait for it... good. Crazy good. He is also young, vulgar, crass, entitled, snobbish, a drunkard, and decidedly 'low-brow'. While Salieri is no doubt jealous of and offended by Mozart and his talent, Mozart functions primarily as a scapegoat for his anger at God: Salieri sets out to ruin Mozart not because he hates him (though he does), but to thwart God. This leads to the climax of the movie, the scene where Salieri helps a dying Mozart compose his own Death Requiem (dying, as in dead by the end of the scene). Despite his hatred of the man, Salieri has admired and even worshipped Mozart's music throughout, and it is here where he finally becomes intimately involved in the creation of exactly the kind of music he wants to write... though through someone else's genius rather than his own. His pleasure, however, comes not from the music, but from literally working Mozart into the grace. Talk about a powerful scene.... and yet I wasn't that moved. Intellectually, yes, but I wasn't that invested in the characters and so I didn't really care, even as I understood the brilliance of the scene. Which brings us back to where we started: a Crazy Good movie that deserved to win the Oscar, but nothing I'd sit through twice. Postscript: I have actually sat through this movie twice. I watched it at my piano teacher's house when I was 14, and found it creepy, disturbing, and yucky. It's none of those things, but I guess my 14-year-old self was uncomfortable with madness and crucifixes (duh). Luckily, another girl there was equally creeped out, and we still good friends to this day. Which, as I've said before, is good. Crazy good.